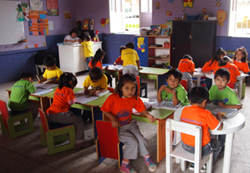 Montalvo School is located in downtown Vilcabamba and is the largest school in the Vilcabamba School District. This school is rare in Ecuador because it receives a great deal of help from the government due to the administrator’s friendship with government officials and because of its large size (averaging about 450 students). Though the ACF has not contributed much to this school, the students, teachers and administrators always are given ACF-branded T-shirts when we come to town. It was a recipient of one of the original computer systems that were brought to Vilcabamba by Craig from the shipment collected by Co-Founder, Mark Pederson’s son as his Eagle Scout Project. The school also provides some high school classes for required special courses available only at this school. The administrator has allowed One World Vilcabamba to conduct their English-Spanish Courses at the school in the afternoons when after classes have been dismissed.